T cells are differentially recruited to the tubulointerstitium during renal inflammation. The selective presentation of chemokines by surface structures may in part underlie this phenomenon. In an attempt to better characterize the presentation of chemokines by tissue environments an exemplary chemokine with a well-defined structure was selected, and a binding assay for the protein on fixed archival tissue sections was developed. This article describes the selective binding of the chemokine CCL5 to renal structures. CCL5 was shown to bind to endothelial regions, interstitial extracellular matrix, tubular epithelial cells, and tubular basement membranes but rarely to glomerular structures in well-preserved kidneys. In contrast, binding of CCL5 to glomerular components was seen in renal biopsies with acute allograft glomerulitis (in which T cells accumulate in glomeruli). The N terminus mediates receptor binding, whereas two clusters of basic amino acid residues (44RKNR47 and 55KKWVR59) are involved in the presentation of CCL5 by extracellular structures. Mutation of either loop abrogated CCL5 binding to tissue sections. Variations of the N terminus and a mutation that prevents higher order oligomerization did not change the binding pattern. The data suggest that renal compartments differ in their capacity to present chemokines, which may help explain the differential recruitment of leukocytes during allograft injury. Both clusters of basic residues in CCL5 are necessary for sufficient binding of CCL5 to tissue sections. Underlying the recruitment of leukocytes to inflamed tissues and allografts is a complex interaction between chemokines and their corresponding receptors, adhesion molecules, and ligands (1–4). Chemokines that are bound to endothelial surfaces trigger the firm adhesion of leukocytes by the activation of integrins and facilitate migration of cells through tissues (5,6). Chemokines are thought to be bioactive in vivo when presented by extracellular structures (e.g., glucosaminoglycan [GAG] structures on cell surfaces or on extracellular matrix [7,8]). This presentation of chemokines is thought to facilitate adhesion under flow and haptotaxis through tissues (migration along a surface gradient). The chemokine CCL5 acts as a ligand for the chemokine receptors CCR1, CCR3, and CCR5 and helps to direct the migration of monocytes/macrophages and T cells (2,9). CCL5 has two clusters of basic residues, a BBXB motif on the “40s loop” of the primary amino acid sequence (44RKNR47) and a BBXXB motif on the “50s loop” (54KKWVR59; Figure 1A). Both regions represent consensus domains for matrix-binding sites, but only the 40s cluster has been shown to facilitate binding to GAG (10). A mutation of the 40s loop 44AANA47 CCL5 is unable to recruit cells in a model of peritoneal cell recruitment (7,10). We recently found that the 54KKWVR59 loop may be important for CCL5 binding to sulfatides (S.S. et al., manuscript in preparation). Scheme of the binding assay and CCL5 binding to lymphatic tissue. (A) Scheme of the CCL5 primary structure. (B) Scheme detailing the in situ CCL5 binding assay. The anti-human CCL5 antibody does not bind to endogenous CCL5 under these conditions. Sections of human tonsils were exposed to wild-type (WT)-CCL5 (C), CCL5 E26A (D), aminooxypentane (AOP)-RANTES (E), and PBS (G) and stained for CD34-positive endothelial cells (F). (C and D) Prominent binding of WT-CCL5 and E26A (a CCL5 mutant that does not form higher order multimers) to structures of the extracellular matrix and to cells within a vessel is seen. Note that there is no apparent difference between the staining patterns, which illustrates that larger CCL5 multimers are not necessary in this assay. (E and F) Consecutive sections were stained using binding of AOP-RANTES (E) and of CD34 (F), which demonstrates binding to a high endothelial venule (arrowhead in E). AOP-RANTES demonstrated the same staining pattern as WT-RANTES. The vehicle control is negative (G). Magnification, ×200. During inflammatory kidney diseases, CCR5-positive T cells preferentially localize to the tubulointerstitial compartment, whereas monocytes/macrophages are found both in the tubulointerstitium and in glomerular tufts (11,12). One exception to this observation is the acute glomerular inflammatory response that is seen in renal allografts (acute allograft glomerulitis), whereby CCR5-positive T cells are often detectable within glomerular tufts (13). We sought to determine whether differences in chemokine binding between glomeruli and the tubulointerstitium may help to explain this observation. With the use of CCL5 as an exemplary proinflammatory chemokine, potential chemokine binding/presentation structures in normal kidneys and allografts were characterized. The relative importance of the 40s and 50s loops in the CCL5 protein for presentation was studied. The wild-type and mutated CCL5 proteins were expressed in Escherichia coli and purified as described previously (7,10). The binding sites in CCL5 are illustrated in Figure 1A. Human tonsils and renal nephrectomies (allografts or normal areas of tumor nephrectomies) were used for establishment of consecutive and double-antibody labeling. Renal allograft biopsies from 15 patients with acute transplant glomerulitis were compared with 10 biopsies without glomerulitis. Patients without glomerulitis demonstrated no significant lesions (n = 5), vascular allograft rejection (Banff 2, n = 4), and tubular injury (n = 1). Diagnoses in patients with glomerulitis were humoral allograft rejection (n = 4), borderline lesion (n = 1), vascular allograft rejection (Banff 2, n = 5), interstitial rejection (Banff 1, n = 1), tubular injury (n = 1), and thrombotic microangiopathy (n = 3). Materials were fixed in 4% buffered formalin and embedded in paraffin following protocols for routine procedures. The binding assay (Figure 1B) was based on a modified immunohistochemistry protocol (14). Sections were deparaffinized in xylene and rehydrated in a graded series of ethanol. Endogenous peroxidase was blocked by incubation with 3% hydrogen peroxide in methanol. Antigen retrieval was performed as described previously (14). Endogenous biotin was blocked using the Avidin/Biotin blocking Kit (Vector Laboratories, Burlingame, CA). Slides were incubated with CCL5 for 1 h. As controls, CCL5 was replaced by vehicle (PBS), the corresponding concentration of bovine albumin, or CCL5 was preabsorbed by exposure to heparin. The anti-CCL5 antibody (VL2) does not detect CCL5 in formalin-fixed, paraffin-embedded tissue under the conditions used, as controls did not demonstrate staining after omission of CCL5. Only exogenously added CCL5 protein could be detected on the tissue sections. For detection, either FITC-labeled streptavidin (Vector Laboratories) or the ABC reagent (Vector Laboratories) with diaminobenzidine and metal enhancement was used (15). Immunohistochemistry for inflammatory cell markers and extracellular matrix was performed as described previously (16). Double fluorescence was used to further define the CCL5 binding structures. When two primary antibodies of the same species were combined, another heat treatment in a microwave oven was performed between the incubation steps. In each series of double labeling, each antibody was replaced by isotype-matched Ig (15). Five allograft nephrectomies with acute vascular and interstitial rejection were used. Frozen sections from allograft nephrectomies were fixed in acetone for 2 min. Immunohistochemistry was performed with the mAb VL2 (17,18) against CCL5, using an amplification system (CSA; Dako, Glostrup, Denmark) according to the protocol provided by the manufacturer. The following antibodies were used: Anti-CD68 for monocytes/macrophages (clone PG-M1; DAKO), anti-CD3 for T cells (clone CD3–12, rat anti-human; Serotec, Oxford, UK), anti-CD34 for endothelial cells, anti–D2–40 lymphatic endothelium (D2–40; Signet Laboratories, Dedham, MA), anti–smooth muscle antigen (SMA; clone 1A4; Dako), anti–human collagen I (provided by Larry Fischer, National Institutes of Health, Bethesda, MD), MC5 against CCR5 (monoclonal mouse antibody; provided by Matthias Mack), and 1C3 against human DARC (provided by Yves Collins, Paris, France) (19). As secondary reagents, biotinylated antibodies (Vector Laboratories), Streptavidin/FITC complex (Vector Laboratories), Cy3 labeled anti-rat antibody (Jackson Immunoresearch Laboratories, West Grove, PA), Texas red, and FITC-labeled anti-mouse IgG (Vector Laboratories) were used. A CCL5 binding assay based on a modified immunohistochemistry protocol using formalin-fixed, paraffin-embedded tissue was established to study the selective binding of chemokines to tissue compartments (Figure 1B). The assay showed a reproducible CCL5 binding pattern on human tonsils (Figure 1C). CCL5 bound to endothelial cells of high endothelial venules that showed a focal, granular deposition (Figure 1, E and F), on the extracellular matrix that surrounded larger vessels and in a matrix pattern that surrounded follicles (Figure 1, C and D). Some circulating cells in larger vessels demonstrated CCL5 binding (Figure 1C). T cells were embedded in a matrix that bound CCL5. The staining of extracellular matrix was similar but not overlapping with the pattern of collagen I (data not shown). Comparison of the staining with CD34 (an endothelial marker), D2–40 (a marker of lymphatic endothelium), and the chemokine- binding protein DARC demonstrated that the majority of the binding structures were not on lymphatic or vascular endothelial cells but associated with the extracellular matrix. Controls with replacement of CCL5 protein by diluent (PBS; Figure 1G), bovine albumin (Figure 3A), or with preincubation with heparin resulted in absence of staining (Figure 2). Modifications of the N-terminal region of CCL5 (i.e., aminooxypentane-RANTES and methionylated RANTES) did not change the binding pattern (data not shown). Finally, CCL5 binding to CD3-positive T cells was not detectable, suggesting that CCL5 binding to T cell–expressed chemokine receptors (e.g., CCR1, CCR5) cannot be detected in this assay. CCL5 binding to preserved renal tissue and collecting ducts in allografts. Tissue sections were taken from the noninvolved part of a tumor nephrectomy that was exposed to CCL5-E26A (C and D) or to diluent (A and B). Note the prominent binding of CCL5-E26A to the basolateral side of tubular epithelial cells, weak binding to extracellular matrix of the interstitium, but very little binding to glomerular structures. Consecutive tissue sections from an allograft nephrectomy were exposed to WT-CCL5 (E) and methionylated (Met)-RANTES (F). This resulted in the same binding pattern with prominent binding to collecting duct cells and interstitial matrix. Magnification, ×400. Normal tissue from tumor nephrectomies was used to test CCL5 binding. The tubulointerstitium was the principal site of CCL5 binding (Figure 2, C and D). CCL5 bound to tubular epithelial cells at the basolateral surface and in a granular pattern in the cytoplasm (Figure 2, C and D). A strong staining of the basolateral area was also found on collecting ducts (Figure 2, E and F). 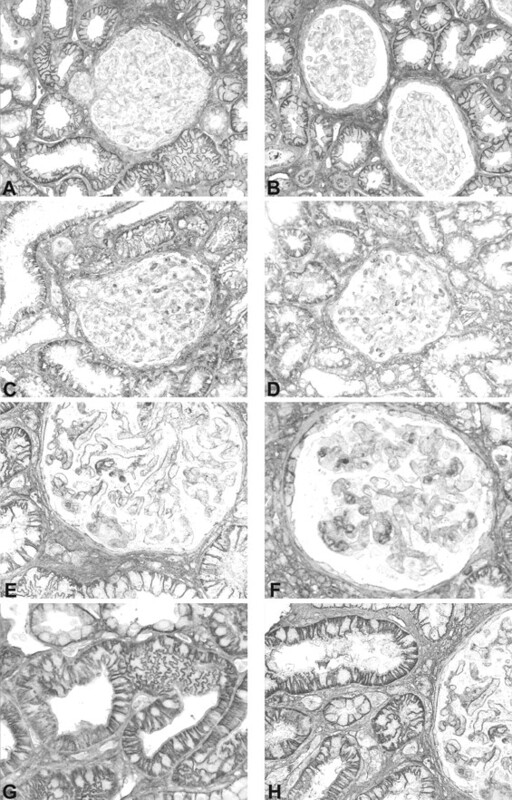 Binding to tubular basement membrane was commonly observed, whereas glomerular regions did not demonstrate significant staining (Figure 2C). Binding was pronounced in areas of focal accumulation of extracellular matrix in the interstitium in the control tissue. Positive staining of glomerular structures was rare, but in these instances, a staining of glomerular endothelial cells was found (Figure 2C). Binding of CCL5 to peritubular capillaries in controls was uncommon, and, when present, a granular deposition was seen. After CCL5 binding to control renal tissue was established, binding to diseased tissue was evaluated. Inflammatory cells in the interstitium of renal allografts were found to be surrounded by CCL5 binding structures (Figures 3C and 4). Areas of interstitial fibrosis demonstrated binding of CCL5 (Figure 3C). CCR5-positive cells that were found predominantly in the tubulointerstitium were surrounded by a matrix that bound CCL5 (Figure 3, C through G). CCL5 binding to peritubular capillaries was more prominent than that seen in controls (Figure 4F). CCL5 binding to a transplant nephrectomy. Consecutive sections of a transplant nephrectomy were exposed to WT-CCL5 (A and F), Met-RANTES (B), and [54AAWVA59]-CCL5 (C) and stained for collagen I (D) or CD34 (E). At a high magnification, binding of WT-CCL5 to circulating leukocytes and to the endothelial surface in a granular pattern can be demonstrated in a peritubular vessel (F). Frozen sections from an allograft nephrectomy were stained with an isotype control Ig (G) and an anti-CCL5 antibody (VL2; H), and binding of WT-CCL5 was localized (I). Note the prominent signal on infiltrating cells (H) for CCL5 protein and the binding to structures of the interstitial matrix (I) but not to glomeruli. Variations in the amino terminus of CCL5 (i.e., aminooxypentane-RANTES and methionylated RANTES) did not affect the binding pattern (Figure 2, E and F). Mutation of amino acid 26 in the primary sequence of CCL5 from a glutamic acid to alanine (E26A) leads to the preferential formation of CCL5 tetramers as apposed to higher order oligomers (20). This modification did not change the general distribution of CCL5 binding, suggesting that oligomerization is not needed for CCL5 binding to renal structures. The matrix binding domains that were previously studied in the CCL5 protein (10) include a BBXB binding motif found in a loop of amino acids that include R44, K45, and R47 (44AANA47 40s loop) and a BBXXB motif that includes K55, K56, and R59 (54AAWVA59 50s loop). Mutation of either the 50s loop or the 40s loop abolished CCL5 binding to renal structures (Figures 3, A and B, and 4C), suggesting that both loops are necessary for efficient binding of CCL5 to presentation structures in renal tissue. For localization of CCL5 in human allografts, immunohistochemistry for CCL5 was performed on frozen sections of allograft nephrectomies (n = 5; Figure 4). CCL5 was mainly localized to the cytoplasm of infiltrating cells in the tubulointerstitium and infiltrating arterial walls in vascular rejection (Figure 4, F through H). Even on frozen materials, only intracellular CCL5 was detectable by immunohistochemistry (17,18). Consecutively, binding of CCL5 was found on structures of the extracellular matrix as in the formalin-fixed, paraffin-embedded materials in the tubulointerstitium. Therefore, the main site of CCL5 expression corresponded to the main site of CCL5 binding structures. CCL5 expression was only occasionally seen in glomerular tufts, by infiltrating cells. A total of 25 renal allograft biopsies were studied. Fifteen of the biopsies were classified as showing acute allograft glomerulitis. In biopsies without glomerulitis, little or no binding of CCL5 was seen in glomerular structures (eight of 10 biopsies). By contrast, in biopsies that showed glomerulitis, a prominent binding of CCL5 to glomeruli was found in 11 of the 15 biopsies (Figure 5, C through F). 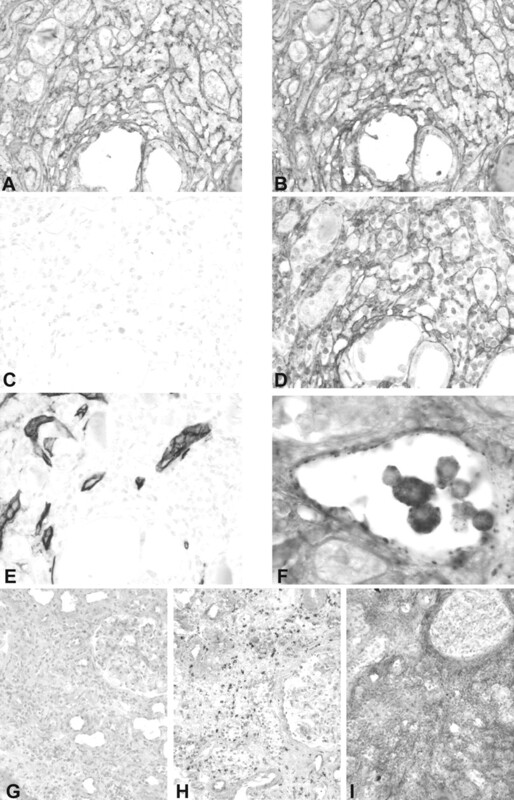 Here, CCL5 binding to infiltrating cells in the glomerular tuft, peripheral glomerular walls (Figure 5, E, F, and H), glomerular endothelial cells, and extracellular matrix in the glomerular tuft was documented (Figure 5H). CCL5 binding to renal allograft biopsies. Binding of human WT-CCL5 was studied on biopsies without allograft glomerulitis (A, B, and G) and with allograft glomerulitis (C through F and H). Note that biopsies with and without glomerulitis do not differ in the tubulointerstitial binding of CCL5 (e.g., G, H), but there is prominent binding to the glomerular tuft in biopsies with glomerulitis (C through F). Magnifications: ×200 in A through D; ×400 in E through H.
CCL5 was found to bind predominantly to the tubulointerstitium in all biopsy samples (Figure 5). The binding to the basolateral surface of tubular epithelial cells described previously was unchanged between the various disease entities studied (Figure 5G). In tubular interstitial areas that showed leukocyte accumulation, the infiltrates were embedded within a network of CCL5 binding structures. 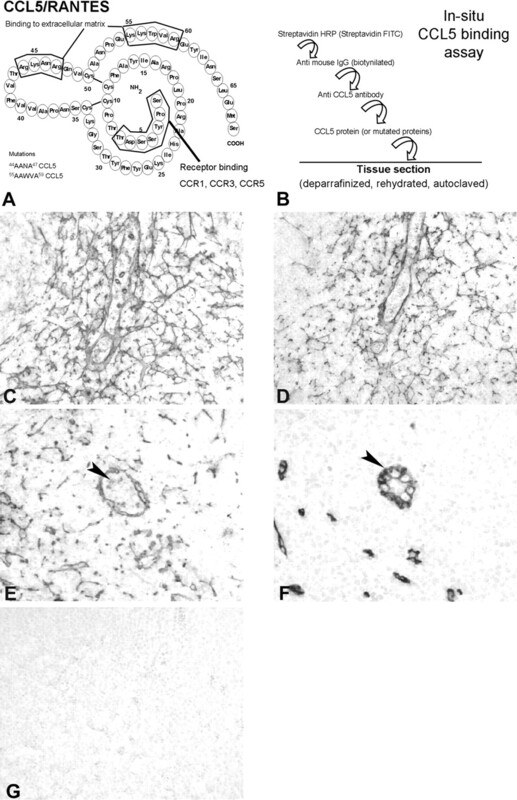 Tubular basement membranes bound CCL5, whereas glomerular basement membrane did not. The formation of microenvironments in lymphatic tissue is a prerequisite for immune surveillance and effector cell accumulation. Recent studies have shown that similar processes lead to inflammatory cell accumulation in specific tissue compartments (19,21). Chemokines fulfill several basic functions. One is integrin activation (leading to induced firm adhesion), a second is the directed migration of leukocytes to specific tissue environments. For both actions, chemokines need to be presented by extracellular structures. To date, the biology of chemokine presentation in normal or diseased tissues is poorly understood (22–24). CCL5 is a proinflammatory chemokine that is rapidly induced under various forms of tissue injury under the control of NF-κB (25). Immune effector cells such as T cells and monocyte/macrophages can be a rich source of CCL5 (26). Intrinsic renal cells, including mesangial cells, podocytes, tubular epithelial cells, and interstitial fibroblasts, also release CCL5 after stimulation in vitro (4). In previous studies, we showed that microvascular endothelial cells upregulate an unknown CCL5 presentation antigen in concert with intercellular adhesion molecule, vascular cellular adhesion molecule, and E-selectin after activation with proinflammatory cytokines (27). During acute allograft rejection, CCL5 was localized in frozen material to infiltrating cells (in glomeruli and the tubulointerstitium), tubular epithelial cells, and endothelial cells of peritubular capillaries (18,28). In diabetic nephropathy and in membranous nephropathy, CCL5 expression was found to be predominantly localized to the tubulointerstitium (29,30). A systematic evaluation of CCL5 on a large number of biopsies has not been performed to date. Cohen et al. (31) described CCL5 protein and mRNA expression in glomeruli from renal allografts. As was previously found (17,18), intracellular CCL5 protein was localized in frozen materials predominantly to infiltrating cells in the tubulointerstitium in renal allograft nephrectomies. Binding of CCL5 to extracellular matrix could not be localized sufficiently by immunohistochemistry alone, which is most likely a concentration problem. Therefore, consecutive binding studies in tissue add information. Here, exogenously added CCL5 was used as a probe to study the selective or regulated presentation on tissues (32–35). We hypothesized that the tubulointerstitium and the glomerular tuft differ in their CCL5 binding capacity, because these regions show a differential inflammatory infiltrate. An “in situ” assay was developed to study this question. In this assay, binding of CCL5 seemed not to be dependent on interactions with the chemokine binding protein DARC or other chemokine receptors. Binding of CCL5 could be prevented by preincubation of the protein with heparin or by mutating either the 40s or the 50s basic loop residues in CCL5. Lymphocytes in the tonsil, as well as tubulointerstitial leukocytes in renal allografts, were found to be embedded in a network of CCL5 binding structures. In the kidney, a prominent compartmentalization was detectable with strong binding of CCL5 seen in the tubulointerstitium. In contrast, binding to structures of the glomerular tuft was weak or absent in well-preserved tissue. Therefore, CCL5 bound predominantly to the renal compartment in which T cells, expressing the corresponding receptor CCR5, accumulate (13). Expression of CCL5 has also been predominantly localized to the tubulointerstitium even in glomerular diseases (29). Unfortunately, we could not demonstrate endogenous CCL5 protein because we did not succeed in establishing a reliable immunohistochemistry protocol on archival, formalin-fixed, and paraffin-embedded tissue yet. Therefore, we could not directly compare endogenous protein expression and CCL5 binding. In a recent study on frozen sections of human renal allografts, the authors described binding of CCL5 to be restricted to the tubular basement membrane. The CCL5 binding was found to be generally increased during rejection (36), but only focal binding to tubular basement membrane was described in the rejecting allografts (36). This is in marked contrast to the results presented here, where use of well-preserved fixed renal tissue allowed demonstration of binding of CCL5 to tubular epithelial cells, tubular basement membrane, and endothelial cells on some peritubular capillaries. It could be hypothesized that binding of CCL5 in the tubulointerstitium might perpetuate the ongoing inflammatory response. Binding of chemokines to tubular epithelial cells, tubular basement membrane, and areas of extracellular matrix accumulation during acute release might result in prolonged CCL5 gradients, attracting CCR5-positive cells to the tubulointerstitium. Importantly, CCL5 binding within the glomerular tuft was found to change in allografts during acute allograft glomerulitis. The change in binding of CCL5 was not a general phenomenon but specifically presented within the glomerular tuft. The increased binding of CCL5 to glomerular structures seen is consistent with the glomerular influx of CCR5-positive T cells that was seen in this allograft pathology (13). The binding of CCL5 to extracellular matrix structures in the tubulointerstitium, particularly at sites of inflammation and fibrosis, was generally more prominent than the binding that could be demonstrated to endothelial surfaces. The predominant interstitial binding could be important for a rapid generation of chemokine surface gradients within tissues or for sequestering leukocytes in interstitial areas where chemokines are generated. GAG and sulfatides both can act as chemokine binding molecules. The BBXB cluster of basic amino acids in the 44RKNR47 loop promotes CCL5 binding to GAG (7,10). It was previously demonstrated that [44AANA47]-CCL5 retains high-affinity binding to CCR5 but has a reduced CCR1 binding (10). The [44AANA47]-CCL5 mutation is still able to induce chemotaxis in Boyden chamber assays (10). We have found that the 50s loop may play an additional role in the efficient binding of CCL5 to extracellular structures to sulfatides, suggesting that chemokine binding in vivo may involve a more complex biology than previously suggested (S.S., manuscript in preparation). Here, both loops with clusters of basic residues had to be intact to promote detectable binding to tissue sections. Mutation of the basic residues of either basic loop abolished CCL5 binding to renal tissue sections. Efficient presentation of CCL5 could strengthen the interaction between leukocyte and endothelium, bringing the N-terminus of the chemokine in contact with the corresponding chemokine receptor on the leukocyte. An additional possible mode of action could involve the “hand-off” of chemokine on the endothelial surface to the leukocyte. However, the demonstration that CCL5 binding to tissue sections was lost by mutation of either site would be more consistent with a model in which both sites interact to increase the binding strength of CCL5. CCL5 binding structures were localized to tubular epithelial cells, basement membrane, and some endothelial cells under basal conditions. The tubulointerstitium was the predominant site of CCL5 binding. Binding to glomerular structures was uncommon but was found in renal biopsies with allograft glomerulitis (consistent with our hypothesis). Binding to tissue compartments may be important for the in vivo function of CCL5. Differences between renal compartments, as well as changes in binding structures during inflammation, may help to explain the differences that were seen in the composition of inflammatory cell subsets that were recruited to inflamed renal tissues. Chemokine presentation adds another level to the complexity of chemokine biology (37). In situ protein binding studies might help interpretation of findings using in situ hybridization or immunohistochemistry. The work was supported by a grant of the Else Kröner-Fresenius Stiftung (Bad Homburg an der Höhe, Germany), grants from the Deutsche Forschungsgemeinschaft (SE 888/4-1 to S.S.; SFB 571 C2 and TR-SFB 36 B6 to P.J.N. ), the EU (Network of Excellence “MAIN” FP6-502935 to S.S. and P.J.N. ), and P6 “INNOCHEM” to P.J.N, H.J.G., and A.E.I.P. We thank Dan Draganovici for technical support and Matthias Mack for providing the CCR5 antibody.